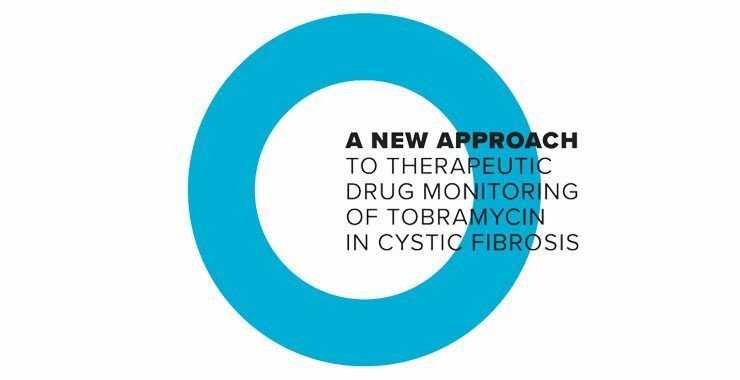 Intravenous (IV) tobramycin, an aminoglycoside antibiotic, is a standard treatment for Pseudomonas infection in patients with cystic fibrosis (CF). However, drug exposure must be maintained within a narrow therapeutic range. If the dose is too high, there is an increased risk of adverse events, such as nephrotoxicity and ototoxicity.1,2 If the dose is too low, there is an increased risk of therapeutic failure, antibiotic resistance and poor patient outcomes.3,4 As a result, therapeutic drug monitoring (TDM) – measurement of drug concentrations in the blood at known times – of tobramycin is essential to enable appropriate dose individualization. In this study, DoseMe, a Bayesian dose individualization platform, is shown to be more accurate at estimating AUC than the conventional two-sample method while requiring only one blood sample and allowing the collection of this sample at almost any patient preferred time. To be effective and well tolerated, tobramycin drug exposure must be maintained within a narrow therapeutic range. Achieving this is further complicated by a high degree of inter- and intra-patient variability in the PK parameters of tobramycin. As a result, therapeutic drug monitoring (TDM) of tobramycin is essential to enable appropriate dose individualization beyond covariate-based dosing (i.e. using age and/or mg/kg). This increases the potential for misleading clinical decision making on these results, having implications for patient safety, including sub- or supratherapeutic dosing. To compare the conventional two-sample AUC estimation method with a one concentration Bayesian method* using DoseMe, and compare these with the true AUC, calculated from sampling across eight timepoints. 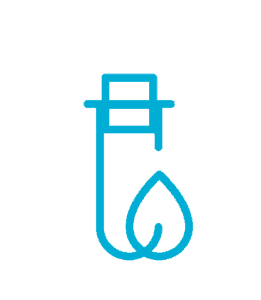 Data were collected from adult CF patients prescribed once-daily intravenous tobramycin at the Mater Health Service (MHS) Respiratory Unit, Brisbane, Australia. 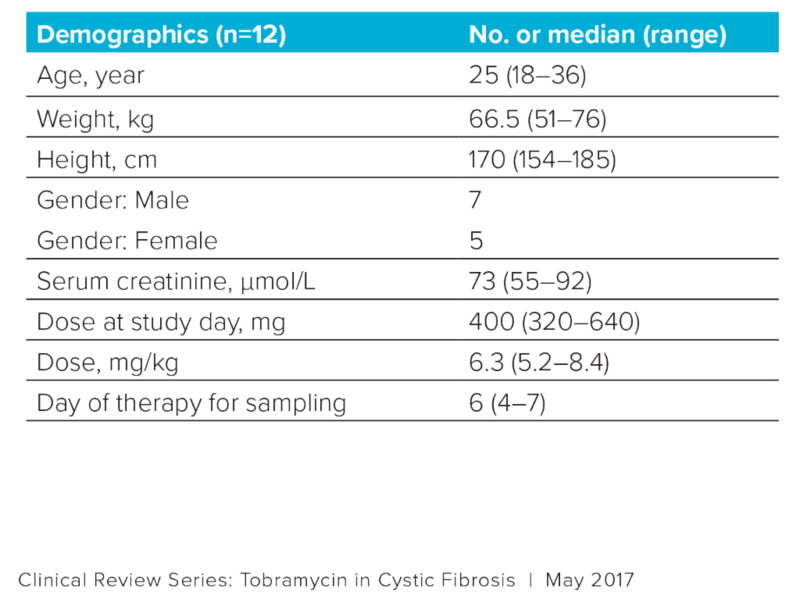 Data were collected from 12 patients with CF (Table 1). model-based clinical decision support. These methods integrate patient data and laboratory results with a prior population pharmacokinetic and pharmacodynamic to estimate a patient’s ability to absorb, process and clear a drug from their system. 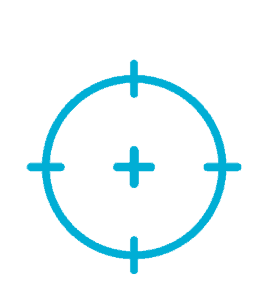 provide a patient-specific dosing recommendation to reach a specific target exposure. 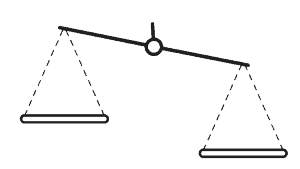 With one sample, the Bayesian method using DoseMe provided similar estimated AUC values to the true, 8-sample trapezoidal AUC. Furthermore, the Bayesian method was both more precise and less biased than the two-sample conventional method using any one sample taken between 2-4 hours after initiation of tobramycin infusion. Figure 3. 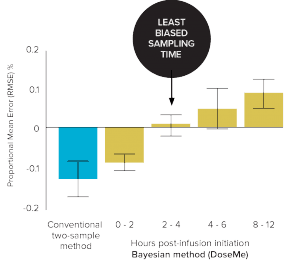 Bias (Mean Error) vs 8-sample trapezoidal method of the conventional two-sample and Bayesian one-sample method using DoseMe up to 12 hours’ post infusion initiation. 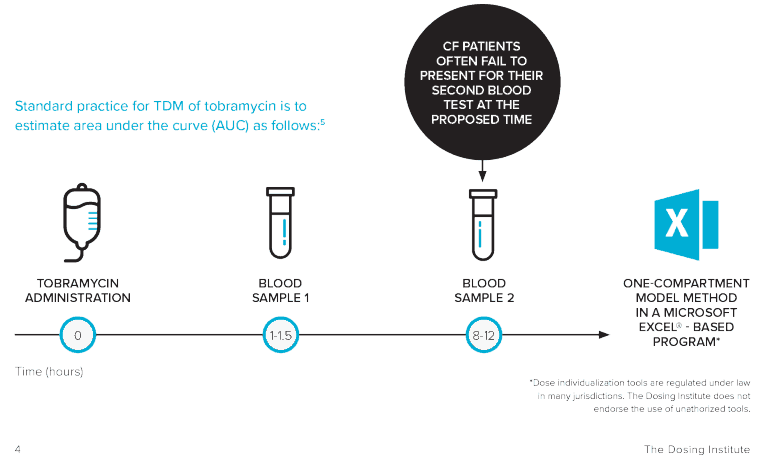 This study demonstrates that tobramycin TDM in CF patients can be simplified safely with a one-sample Bayesian method. 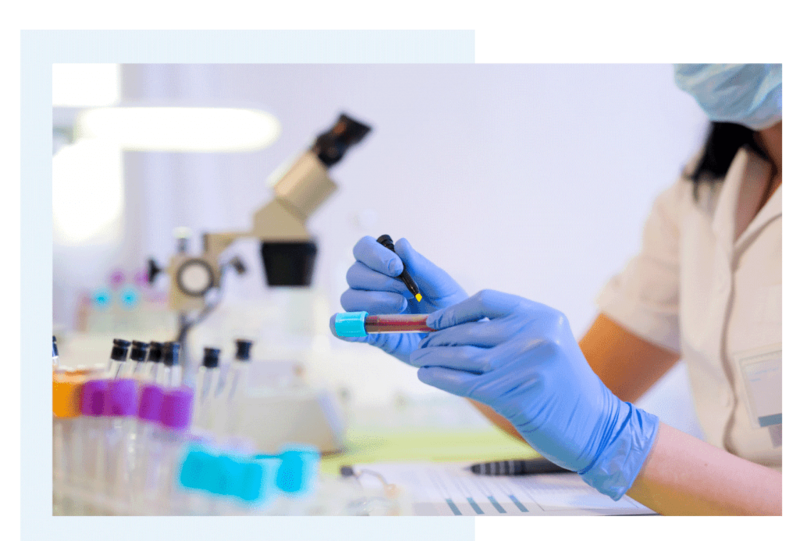 The reduced requirement for blood collection samples not only lessens the burden placed on CF patients by alleviating overall time spent in hospital, but additionally reduces cost by removing unnecessary assays. 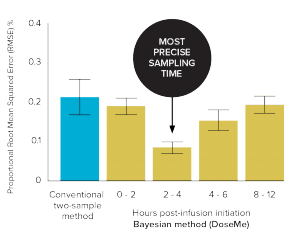 Bayesian dosing method achieves higher accuracy and precision in calculating AUC using half as many laboratory results as the conventional clinical method. Using the DoseMe Bayesian dosing method, only one assay result is required for accurate AUC estimation. 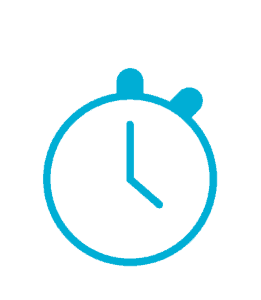 Bayesian method allows collection to be at a patient or provider preferred time. 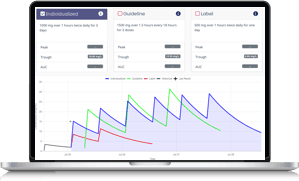 While ideally 2-4 hours after initiation of infusion – any single time up to 12 hours is as accurate as conventional methods. Ratjen F et al. J Cyst Fibros 2009;8:361–9. Mulheran M et al. Antimicrobial Agents Chemotherapy 2001;45:2502–9. Cohen-Cymberknoh M et al. Am J Respir Crit Care Med 2011;183:1463–71. Ratjen F, McColley SA. Am J Respir Crit Care Med 2012;185:933–6. Barras MA et al. Antimicrobial Agents Chemotherapy 2016;60:6698–702. Mould G et al. Clinical Pharmacology & Therapeutics 2016;99/4:405-418. Hennig S et al. Clinical Pharmacokinetics 2013; 52:289-301. Li C, Therapeutic Drug Monitoring of Vancomycin in the real world. IATDMCT Compass. Mar 2017.